Real Runner Reviews: Do you know when to replace your running shoes? The Mino does! Do you know when to replace your running shoes? The Mino does! Do you know that running on worn out shoes is one of the primary reasons for injuries in runners? Do you know when to replace your shoes? Trying to get a straight answer out of any runner or running store as to when you should replace your shoes is difficult at best. There are a few common theories. One theory is that you should replace your shoes every 300-600 miles depending on the brand. I have read about runners who replace their shoes every 200 miles and others who run over 1,000 miles in a pair of shoes. 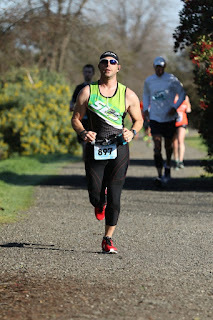 The truth is that you can’t really go by mileage because it depends on too many factors including you weight, running style, and type of terrain you run on. Another popular theory is that you should replace your shoes every 6 months. This is not a good option either. I might run 400 miles in that 6 month period where another runner might run 100 or 2,000 miles in that same 6 month period. Many runners also have several pairs of shoes so they might not put that many miles on each pair of shoes. The third theory that I hear a lot is that people retire a pair of shoes when they can tell that the cushion or sole of the shoe shows wear. The problem with this theory is that by the time you can see that the soles are worn out or that the cushioning has started to collapse, you have probably already started to injure yourself. So how do you know when to replace a pair of shoes? There is a product called the Mino that can help. 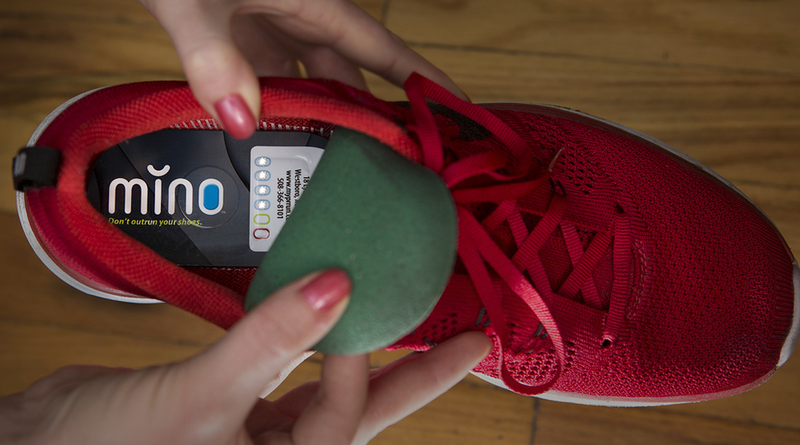 The Mino is a 2.5mm thick pad that you put under the insole of your shoes. It measures the compression each time you take a step. The best part is that you don’t have to worry about when to replace your shoes. The Mino has a set of 6 lights. As you run more miles in your shoes, more lights will illuminate. When you get to the 5th (yellow) light you know that you will need to replace your shoes soon. The 6th (red) light means you need to replace your shoes now. 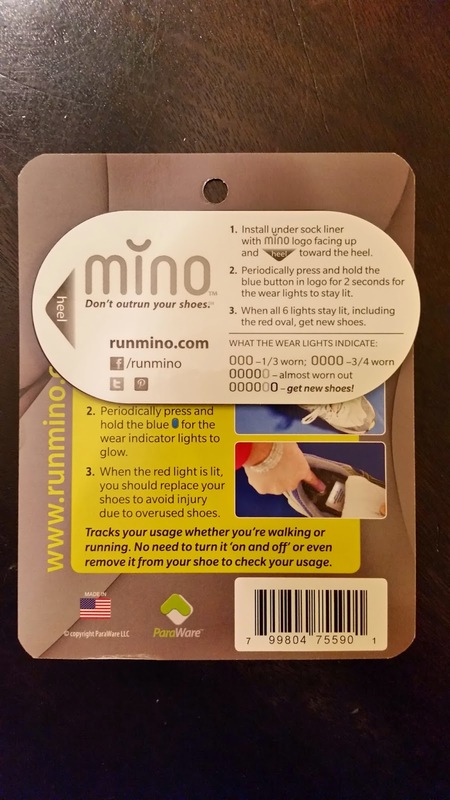 Every once in a while, just lift up your insole and push the button on the Mino to see how many lights are lit up. It really is that simple. My primary concern was if I would feel this under my insole or if it would change the way I ran. I was surprised to find out that I didn’t even know it was there. The Mino comes with a 2nd pad to put in your other shoe so your feet will still be the same height from the ground. Some runners track mileage for each shoe they run in. What a pain! I have several pairs of shoes and don’t want to hassle with a spreadsheet to track my mileage. I absolutely love this product and I have a pair in every shoe that I own. 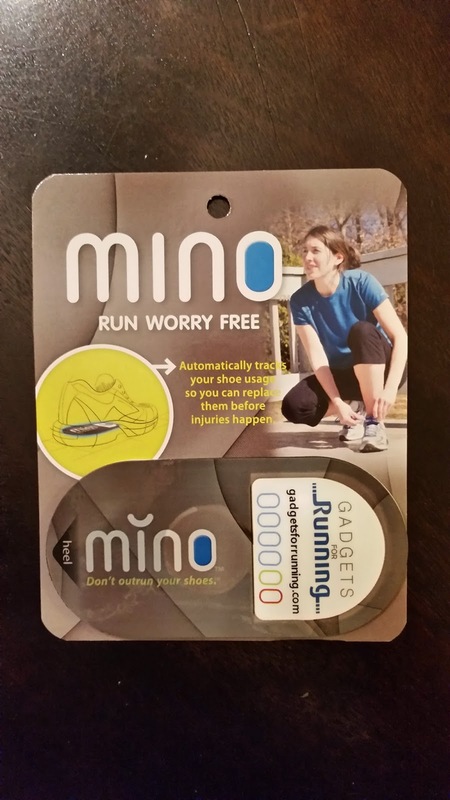 For the month of November, you can purchase the Mino at 33% off ($10 each) at www.runmino.com. Use the coupon code "TEN" at checkout. You can find out more information about the Mino on their website as well. Your shoes are intended to protect your feet for a set amount of miles and after that; you dramatically increase the chance of injury. I think the Mino could quite possibly be the product of the year in 2014. 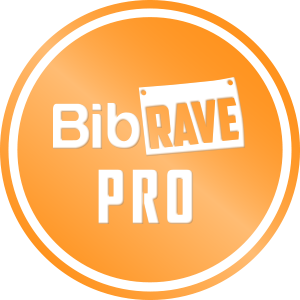 This would be a great holiday gift for the runner in your life. Grab your own Mino and let me know what you think.